Second California town makes solar installation mandatory on new homes | West Coast Solar, Inc.
Now, the small town of Sebastopol in the Sonoma Valley wine country has become the second community in the state to adopt a new building code requiring all new homes have PV systems installed on their roofs. This notoriously liberal community of roughly 8,000 is following in the footsteps of Lancaster – a municipality of more than 150,000 – in adopting such legislation, showing that California remains on the leading edge of advocating alternative energy. While Sebastopol is located in the more temperate northern portion of the state, Lancaster has a very different, drier climate given its location in the desert. This just goes to show that there is a wide appeal for this method of electrical production. According to local news source the Santa Rosa Press Democrat, the system would have to provide 2 watts of power per square foot of insulated building area or offset 75 percent of the structure’s annual electric load. In areas where solar isn’t ideal – like shady properties with lots of tree coverage – residents can instead look other alternative forms of power production. 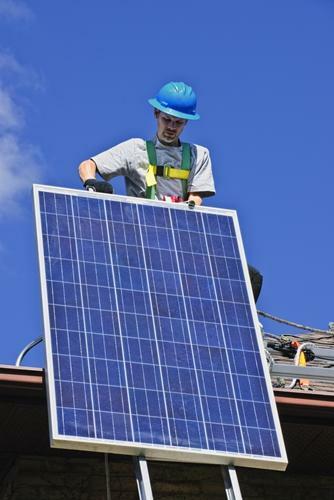 To learn more about Bay Area solar installation, contact West Coast Solar today and see if PV installation is for you.